Surface Computer users can fingerpaint digitally, resize and interact with photos and videos, and even "digitize" some real-life events, such as splitting up a restaurant bill and researching wines. The Surface Computer can recognize some real-world objects and creates onscreen versions to interact with. Microsoft has just announced its Surface Computing technology, a project that has been kept under wraps for five years. 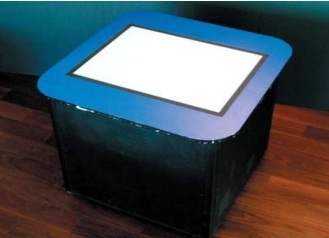 Using a giant table-like display, users are able to draw, interact with media, and use another new technology called domino tagging, in which a real-life object on the computer's surface is identified and becomes an on-screen object. Picture a surface that can recognize physical objects from a paintbrush to a cell phone and allows hands-on, direct control of content such as photos, music and maps. Today at the Wall Street Journal's D: All Things Digital conference, Microsoft Corp. CEO Steve Ballmer will unveil Microsoft Surface™, the first in a new category of surface computing products from Microsoft that breaks down traditional barriers between people and technology. Surface turns an ordinary tabletop into a vibrant, dynamic surface that provides effortless interaction with all forms of digital content through natural gestures, touch and physical objects. Beginning at the end of this year, consumers will be able to interact with Surface in hotels, retail establishments, restaurants and public entertainment venues. The intuitive user interface works without a traditional mouse or keyboard, allowing people to interact with content and information on their own or collaboratively with their friends and families, just like in the real world. Surface is a 30-inch display in a table-like form factor that small groups can use at the same time. From digital finger painting to a virtual concierge, Surface brings natural interaction to the digital world in a new and exciting way. For years engineers and computer technicians have looked for a better way for people to communicate with their computers. Keyboards while feeling natural to many of us has advanced very little beyond the typewriters which have been around for well over a hundred years and though the mouse is a step above that it still takes practice for someone who has never used one to become used to the idea of moving the mouse with it and after years of using a computer many older people still have trouble with the concepts of double clicking, right clicking, dragging, dropping and other techniques that can seem simple to more advanced computer users. The most recent solution, and one that seems likely to stick is that of surface computing. Surface computing at its most basic is an attempt to make the use of a computer better match the way we interact with other things in our environments as well as better interacting with those things and allowing for far less time thinking about how we interact with our computers so more energy can be put into how we use them. The most common and popular type of surface computing is that of touch screen monitors of the type that can be found on many modern phones. 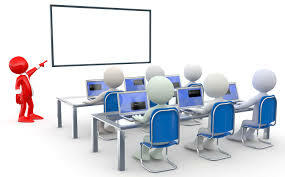 These are also common in many businesses where untrained workers are expected to use a computer. Until recently though these touch screen monitors were really little more than a replacement of the mouse. You could still only point at one thing at a time, and it wasn't even as good as a mouse because you can't right click or highlight things without using a keyboard. More recently though both Microsoft and Apple have come up with new ways to use surface computing.Microsoft's plan is a device called Microsoft Surface which takes the form of a large table and would be used in places such as hotels and casinos or board rooms. The key difference between this and other similar devices is the multi touch system. This allows users to use both hands to manipulate things such as photos, as well as the use of hand gestures and even physical gestures. Other features on the Microsoft surface allows for wireless communicates between devices so things like phones, cameras and laptops can sync with the table and move data between them effortlessly. Surface computing is a powerful movement. In fact, it’s as significant as the move from DOS [Disk Operating System] to GUI [Graphic User Interface]. Our research shows that many people are intimidated and isolated by today’s technology. Many features available in mobile phones, PCs and other electronic devices like digital cameras aren’t even used because the technology is intimidating. Surface computing breaks down those traditional barriers to technology so that people can interact with all kinds of digital content in a more intuitive, engaging and efficient manner. It’s about technology adapting to the user, rather than the user adapting to the technology. Bringing this kind of natural user interface innovation to the computing space is what Surface Computing is all about. In 2001, Stevie Bathiche of Microsoft Hardware and Andy Wilson of Microsoft Research began working together on various projects that took advantage of their complementary expertise in the areas of hardware and software. In one of their regular brainstorm sessions, they started talking about an idea for an interactive table that could understand the manipulation of physical pieces. Although there were related efforts happening in academia, Bathiche and Wilson saw the need for a product where the interaction was richer and more intuitive, and at the same time practical for everyone to use. Journalists can find still images and broadcast-quality broll and video (registration required) of Microsoft Surface. "With Surface, we are creating more intuitive ways for people to interact with technology," Ballmer said. "We see this as a multibillion dollar category, and we envision a time when surface computing technologies will be pervasive, from tabletops and counters to the hallway mirror. Surface is the first step in realizing that vision." The next phase of the development of Surface focused on continuing the journey from concept to product. Although much of what would later ship as Surface was determined, there was significant work to be done to develop a market-ready product that could be scaled to mass production. In early 2006, Pete Thompson joined the group as general manager, tasked with driving end-to-end business and growing development and marketing. Under his leadership, the group has grown to more than 100 employees. Microsoft Surface puts people in control of their experiences with technology, making everyday tasks entertaining, enjoyable and efficient. Imagine ordering a beverage during a meal with just the tap of a finger. Imagine quickly browsing through music and dragging favorite songs onto a personal playlist by moving a finger across the screen. Imagine creating and sending a personal postcard of vacation pictures instantly to friends and family, while still wearing flip-flops. Surface also features the ability to recognize physical objects that have identification tags similar to bar codes. This means that when a customer simply sets a wine glass on the surface of a table, a restaurant could provide them with information about the wine they're ordering, pictures of the vineyard it came from and suggested food pairings tailored to that evening's menu. The experience could become completely immersive, letting users access information on the wine-growing region and even look at recommended hotels and plan a trip without leaving the table.